Hello friends, my name is Mabel. 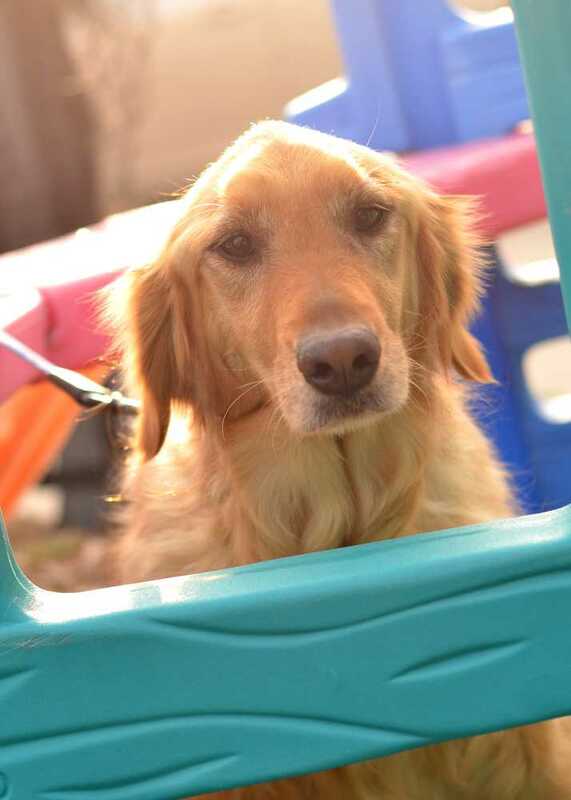 I’m a 4 year old, spayed, female, Golden Retriever. My life has been a bit of a crazy one. I was originally bought as a puppy from a pet store in a place called Pennsylvania. From there my current mom doesn’t know much other than at two years old I landed in up-state New York in my second home with a nice lady and an old Boxer. That nice lady worked long hours and we lived in a small trailer with no yard. She wasn’t able to care for me anymore so she started telling her friends that I needed a new home and she was thinking about taking me to the local shelter. At the same time, my current family was looking for a new golden retriever to be a 4H obedience dog for their oldest daughter. Word was spread about me and I ended up making the 10 hour drive to Indiana via three nice ladies, to my current home. When I got here to Indiana I was 10-15 lbs. over weight, had ear infections, and a bad skin infection. I was as sweet as can be though and I fit in well with the family and their current two dogs right away! Unfortunately, only a few short days after arriving at my new home, I began not feeling well and on my fourth night here I had what mom said was a grand mal seizure. Luckily, my mom is a Veterinary Technician and knew what this was & helped me through it. The following week I had several more seizures and my mom took me to see a Veterinary Neurologist. She had noticed that I didn’t act quite “normal” (like the other dogs in the family), and the Neurologist confirmed that I most likely have some brain damage from undiagnosed severe epilepsy. They started me on medicine for my seizures and now I feel a LOT better. My skin and ears cleared and I lost the weight too! However, I still don’t see very well, get nervous at loud sounds and commotion, and I sometimes have a hard time controlling my tongue. My seizures are well controlled, and I’ve only had two in 2019, though I still have seizure “ticks” when I get excited. My seizure “ticks” are where I can’t seem to get control of my tongue and it causes me to paw at my face a bit. I’ve learned though that if I lie down and calm myself my ticks stop. These ticks don’t keep me from enjoying life though. I love being out with the other dogs, I LOVE to eat, and over all I’m a very happy girl. I don’t really know how to play fetch and I like toys some of the time. The other dogs in my home have taught me a lot about this thing called play and toys! I like chewing on bones, however with my tongue control issues, my mom doesn’t let me have them anymore ever since she had to pull a huge bone out of my throat that I had accidentally almost swallowed whole! My mom says I’m the quietest dog she’s ever owned. I only seem to bark when I occasionally have nightmares while I’m sleeping. I also don’t mind car rides, stand perfectly still for baths, don’t mind my nails being trimmed, and despite all of the meds I’m on, I gobble them up in my food! I like everyone, including other dogs, and though my home doesn’t have any cats, I think I would like them too! The only thing I can’t understand is why my current family runs after I snack on the poop left in the yard! It’s so yummy! Despite medicine and severe epilepsy, one of my human sister’s was able to show me in 4H during my first summer in Indiana. I even got second place because I knew how to stay in one place for a long time! Unfortunately, I got increasingly stressed the more I was trained. I just couldn’t keep up with all that I was supposed to learn, as learning new things is difficult for me. My training anxiety and my vision issues meant that I was retired from being a 4H dog after only one year. Since coming to Indiana, my family has had a fifth human child. As much as I love kids, and the kids I live with are super nice to me, I get very nervous when they start getting loud and running through the house. I prefer to either be outside or stay in my crate because I can’t handle the chaos. I love to be petted, brushed, and loved on, but many times, I don’t like all of the commotion very much so I choose to stay in the quiet, away from everyone. My mom is always saying she feels bad for me. There are two other dogs in the family and they get to be in 4H and get trained and go for walks. But, since I have anxiety about being trained and all of the kids running around, I don’t feel comfortable going on the outings. My mom says she would love for a quieter home to want to take me in and love on me. She says I deserve someone that has more time to spend on my “special needs” and love me for who I am. I am a very sweet girl, but my life is pretty lonely right now except for my two dog brothers that have crates next to mine. I have also had to be put on another medication because I kept getting infections that made me leak urine. Ever since this new medication however, I no longer leak urine in my crate and no more infections! In fact, my mom says I have a bladder of steel (whatever that means!) because I just don’t have to pee very often. I’ve never had an accident in the house other than during a seizure or when I had the UTIs, and that was only in my crate when my family was at work for 10+ hours. My family love & cares for me and are committed to keep me in the family, even if a better fit for me doesn’t arrive. However, I am a young golden girl and have a lot of life left to live. I’d love to find a forever home with someone that will love me and my quirks, and who will make sure I continue to receive my much needed medications. If you are interested in meeting me, please let my mom know! I know my family loves me because they’ve told me they will not let me go to just anyone. They say the person has to be extra special and their home has to be the right fit. Because they only will accept the best for me they asked their friends at GRRACE to help get the word out about their search.